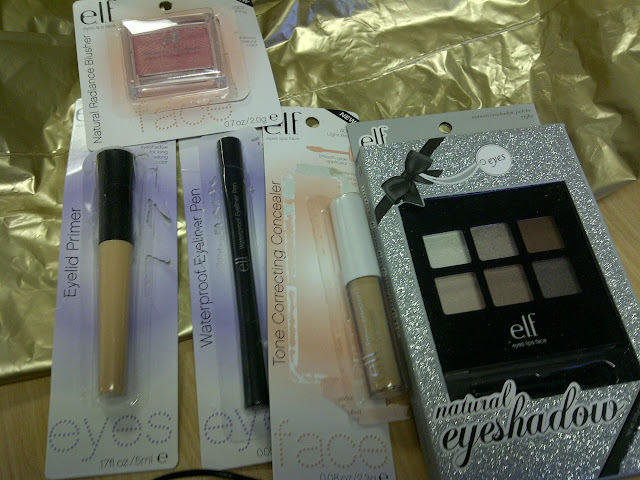 One of them was a gift which was the Six piece eye shadow set in Natural. I'm so impressed with the packaging, it makes it seem really nice quality, and it was only £2.10 in the sale! total bargain. I then thought I'd try out a Eyelid primer, which bought in Sheer, and it goes on kind of creamy, and you pat it on and it dries sheer, and feels really smooth and makes it easy for eye shadow to go on, and it keeps in on for ages. Well worth the 90p i paid for it!!! I then bought a Waterproof eye liner pen as im really bad at putting eye liner on, but this the best and easiest eye liner i have used to date. I did notice today that its best not to use it with the Primer as it made the pen go a bit dry and i had to shake it and put the lid on for it to get moist again...again this was 90p and well worth it! I also got a Natural radiance blusher, and its the hardest make up item i have ever had to open!! it took 2 people to work it out, and then finally we got it open! haha - it looks glittery in the palette, but then when you put it on it doesn't actually look glittery, which is good as im not 13 any more! this was 90p, its quite small but im impressed so far! Last thing i bought was a tone correcting concealer, which is really good! gets rid of red blemishes, under eye circles and any other odd things on your face.. :) - again 90p. and its a sponge applicator so its easy to put on, and has really good coverage. I got this by accident, but im glad i did as its best concealer I've used to date. I'll definitely be putting another order into E.L.F as i want to try some more things like Lipsticks, and some studio make up they do.